My name is Vernal Branch, and I represent Breast Cancer Action, a national education and advocacy organization that carries the voices of people affected by breast cancer to inspire and compel the changes necessary to end the epidemic. BCAction has over 32,000 members nationwide who believe that patients should come before profits. 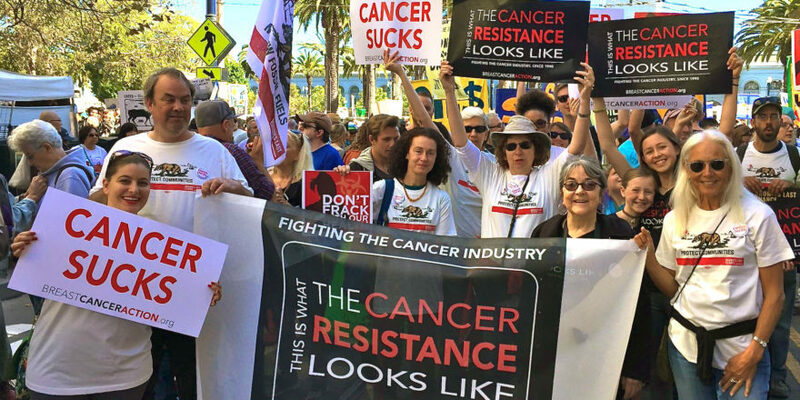 Our members trust us to advocate for public health because we don’t accept any money from pharmaceutical companies or other corporations that profit from or contribute to cancer. Metastatic breast cancer is a heartwrenching diagnosis and we believe we need more effective and less toxic treatments. Like many others who care about people affected by breast cancer, we would have been pleased if data presented showed Avastin to be a more effective treatment for metastatic breast cancer than other drugs already on the market. Unfortunately, the existing evidence from randomized, controlled clinical trials conducted by the drug’s manufacturer, Genentech, has demonstrated that Avastin has not lived up to the initial hype. Trials completed on Avastin, including the AVADO, RIBBON 1, and RIBBON 2 trials, did not provide any evidence of increased overall survival. While they demonstrated some improvement in progression-free survival, BCAction remains convinced that it is not enough to justify FDA approval for treating metastatic breast cancer. Furthermore, subsequent trials failed to show the same length of progression-free survival in the original study. Dr. Richard Pazdur, the director of the FDA’s Office of Oncology Drug Products, in his comments to the Oncologic Drugs Advisory Committee (ODAC) in July 2009, noted that “the approval process is not merely a screening process for drug activity. The goal of a registration trial is not merely to obtain a statistically significant result. The primary goal is to obtain a statistically reliable evaluation of the drug that represents a clinically meaningful result that yields a favorable benefit/risk evaluation.” Trials involving Avastin have simply not yielded a favorable benefit/risk ratio. BCAction advocates that drugs should only receive FDA approval if they improve overall survival; or improve quality of life; or cost less than therapies already available. Avastin meets none of these criteria. A major problem with Avastin is that it has not been shown to increase overall survival for patients that took the drug. Overall survival was not used as the endpoint in studies, which means that we have no data on whether patients live longer overall when taking the drug. However, overall survival is the most beneficial measure for patients, as it is objective. BCAction advocates that objective measures of drug efficacy are the most critical when evaluating the benefit to patients. Quality of life is a very subjective issue. However, some of the possible side effects associated with Avastin (either by itself or in combination with another treatment) could, if present, greatly diminish a person’s quality of life. Even more devastating than a diminished quality of life, some of these side effects are tremendously dangerous and sometimes fatal – they include gastrointestinal perforation, spontaneous splitting open of organs or wounds, internal bleeding, elevated blood pressure, congestive heart failure, heart attack, and stroke. BCAction strongly advocates for more effective and less toxic treatments for patients with metastatic breast cancer. Avastin is simply not that treatment. Women with metastatic disease deserve better. BCAction understands that Genentech and its parent company Roche are proposing an additional trial to study the efficacy of Avastin combined with Paclitaxel compared with Paclitaxel alone. It will also assess VEGF-A, a biomarker for patients that may be more likely to benefit from treatment. While we are not opposed to a new trial, we do not believe that Avastin should retain its approval for treatment of metastatic breast cancer while further study is conducted. If there is new evidence, Genentech should follow the existing process. The current decision before the FDA should be based on current available evidence, not on possible future studies. Current data fails to show that the benefits outweigh the serious risks associated with Avastin. We simply cannot retain approval for a drug while waiting to see if it is proven effective. We all want better treatments for women with metastatic disease. Evidence has shown that Avastin is not that treatment. The FDA must require that pharmaceutical companies sell more than hope to patients. BCAction recommends that the FDA stay the course with its December decision to revoke accelerated approval of Avastin until new evidence is produced that shows an improvement in overall survival. Avastin has helped many women who are MBC. Taking it away will only hurt them. Every chemo has side effects and it is up to the individual to decide if they want to take that risk. As a former Avastin patient, who had success and side effects from this drug, I fully support those women who have done so well with this drug. I am very upset that you spoke against this drug. I can no longer support your organization. BCAction has been advocating for ALL women, and for better care, better trials, less prattle about pink, and solid, evidence-based medicine. As an advocate for BCAction, and all it has done, I hope that you will do well, even though you are now NOT taking AVASTIN. Did you stop because your insurance would not pay for the drug? Pingback: Die Sachverständigen-Expertise von Breast Cancer Action zur FDA-Zulassung von Avastin zur Behandlung von metastasiertem Brustkrebs – infoblog! I have been on a clinical trial for three years taking a hormone pill and avastin. Have some side effects but over all so far so good.